MITRE employees work to make our nation safer every day. That means we're always looking toward the future when finding new employees with the same commitment to the public interest. And what better way to introduce MITRE to university students than through the experiences of local college alumni? Recently, MITRE hosted a group of 19 Harvard University and Tufts University students at our Bedford, Massachusetts, campus. We introduced them to MITRE’s public service mission and how the federally funded research and development centers (FFRDCs) we operate fulfill that mission. We also described the many career opportunities—in areas such as cybersecurity, aviation, healthcare, and defense—that we have for new college graduates. MITRE's cross-corporate academic engagement team—a group committed to building and sustaining engagements with universities—coordinated the Technical Career Day. Led by Jill Drury and Edlyn Levine, the team consists of volunteers across MITRE who engage with their alma maters. The academic engagement team works with universities in three areas: recruiting activities, research collaboration efforts, and increasing awareness of MITRE and its work. Jeff D'Amelia, a Tufts University alumnus, says these events are a great way to introduce MITRE to potential hires. This year's group of students represented a variety of majors, including mechanical engineering, electrical engineering, computer science, computer engineering, human factors engineering, applied physics, applied mathematics, and statistics. Dr. John Betz, a MITRE Fellow, welcomed the students, who also listened to technical presentations given by event organizers Chris Teixeira, Rachel Bainbridge, and Nick Rotker. The students toured lab facilities, including the Antenna Test Ranges, Mechanical Reliability Test Lab, Synthetic Patient Generation (Synthea), Resources for Early Agile Capability Testing (REACT) Lab, and Vehicle Electronics Security Lab. "They also participated in a panel discussion on the early career experience at MITRE and learned about what makes the company a great place to work," D’Amelia says. "The students were very engaged throughout the day and asked questions about our technical work and our corporate culture," he adds. "They left MITRE with a completely new perspective of our work. More than a few have inquired about how they can find opportunities to join us, and some are already interviewing for positions." 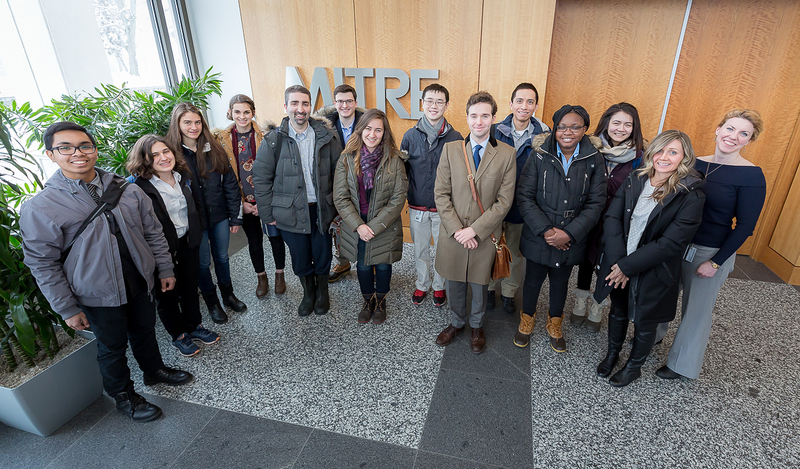 Last year, MITRE hosted students from Northeastern for a similar on-campus event. Organizers in Bedford plan to hold the Technical Career Day annually, expanding to include more universities, on-site interviews, and student networking. "Our goal is to attract the best and brightest to come work at MITRE," Levine says. "This event takes advantage of Bedford’s proximity to top-tier universities by bringing students on-site to interact directly with our staff and learn about our work." Drury adds, "Technical Career Days are part of our long-term goal of connecting regularly with students well before the time when they are actively looking for employment." It also gives students a close look at how MITRE researchers are applying their expertise to working in the public interest. "There is no better place to apply your training and skills to meaningful technical challenges than MITRE," says Chief Operating Officer Pete Sherlock, who started at MITRE after completing his master's degree at Worcester Polytechnic Institute. "I'm delighted that the academic engagement team helps us reach more students, offering them the chance to build a rich career and make impact on a national scale." If you’re a college student interested in MITRE, check out our current Job Openings or read more about our Student Programs.